How does music listening really help? Exposure to new music & genres. If we listen to a broad spectrum of music, we learn the styles, rhythms, and sounds of different types of music in an organic way. This makes it easier to reproduce them later on. Listening to different interpretations of specific pieces we are learning in lessons can help target spots we still want to work on. It can also help us recognize different possibilities for how we might want to shape our interpretation of the piece. Recognizing musical expression. While we practice technics in lessons to draw out the expressiveness and grow in musicality, this is one of those areas that it can really help to have some intuition. Knowing how we can create different moods for our audience by playing forcefully vs. hesitantly, or loud vs. soft. Sometimes students get so caught up in getting the notes & rhythms correct that they can sound a little robotic. 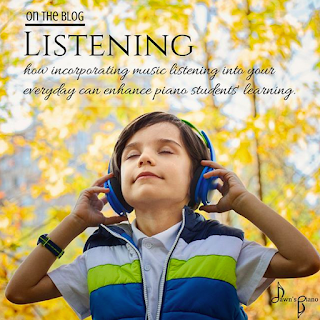 Listening to music helps students know what expressive music sounds like, and helps us imbue our own music with emotion. Inspiration. I often ask students if they've heard any music they'd like to learn. The more we hear, the more we are motivated to learn. Developing a taste for which music we like goes a long way in creating a well-rounded, lifelong musician. What kind of music should we listen to? Anything & everything. As mentioned above, developing a taste for what music we like to play or hear is important to our identity as a musician. Different times and places may lend themselves to different types of music, choose what you want to hear, or ask your piano kid what they want to hear. Pieces we are learning. Having a running playlist of pieces your piano kid is learning for them to listen to from time to time could be an amazing way to supplement their off-the-bench time at home. Our schedule is so busy, how can I fit in some effective music listening? In the car. We spend lots of time in our cars, curating a 'car playlist' or trying out different Spotify stations for your kids can be a great way to integrate some new genres into their music listening each week. Make a soundtrack to your everyday tasks. Choose music based on what you're doing, and let it play in the background. Personally, I find it difficult to listen to certain types of music when trying to work or fall asleep because my focus will get pulled into what the music is doing. If I'm doing housework, driving or just hanging out, I may go for something more active or that I want to sing along to. Notice music in movies, TV shows or video games. Music is already everywhere. When you're shopping, when you're on hold, watching a show or movie, in video games. Notice when music shows up in your piano kids everyday and help draw their attention to it. Do they like the music they're hearing? Why or why not? Help them curate their taste. Song Exploder Podcast. For budding songwriters or music analysts, this is a terrific podcast in which artists talk about how they write their songs. Since the podcast hosts a wide variety of today's artists, this can also be a great way to discover new music & genres. What is Ms. Dawn listening to? Currently as I'm writing, I'm listening to a Skyrim station on Pandora. I really enjoy video game & movie soundtrack music in the background when I'm working on something that requires focus. And remember that I mentioned earlier listening to music can trigger inspiration? A couple minutes ago a piece from Final Fantasy that I've been meaning to learn came on, so I took a second to go purchase some sheet music for it. The goal is to never stop learning & being inspired by other musicians.